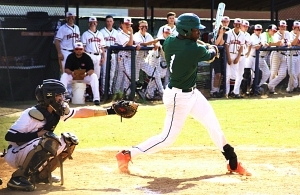 Arabia Mountain and Chamblee both loss the deciding third games of their Class 5A Sweet 16 series on Friday to end the 2018 DeKalb County baseball season. The Rams could not get their bats going in the 10-0 loss to Flowery Branch after falling behind 6-0 in the second inning. Flowery Branch was able to close out the game in the fifth inning with four runs. Arabia Mountain (23-8) had almost rallied to win game one falling 7-6 after scoring four runs in the bottom of the seventh when trailing 7-2. The Rams bounced in the second game to force the third and deciding game with an excellent pitching performance by Corey King getting the 4-2 victory. Carrollton (28-8) came back at home from a 1-0 series deficit to win the second and third games to knock the Chamblee Bulldogs (25-10) out of the playoffs with an 11-1 win on Friday. The Bulldogs fought off the Trojans for a big 8-6 first game win on Thursday to take the series lead. Carrollton answered with a big 15-0 victory to force Friday’s series deciding game.